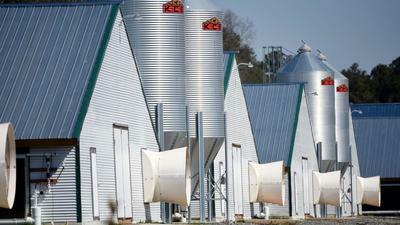 A year after fighting off a proposal to monitor air pollution levels around industrial-scale chicken houses on Maryland’s Eastern Shore, the poultry industry has joined with state environmental regulators to study whether the farms are polluting the air. Officials expect to install a pair of monitors testing for ammonia and particulate matter by this summer. James Fisher, a spokesman for industry group Delmarva Poultry Inc., said the aim is to settle concerns from residents about whether it’s safe to live near large chicken houses, which are each capable of housing thousands of birds. Maryland Environment Secretary Ben Grumbles called the effort “a great step forward” given how little is known about the impact of poultry farms on air quality. He said the initiative was his first item of discussion with Environmental Protection Agency staff after the partial federal government shutdown ended Friday. But the plan is significantly narrower in scope than a proposal the General Assembly considered last year to commission a scientific study of air quality around poultry farms. State environmental officials said the data to be collected will be representative of the emissions produced by farms across the Delmarva peninsula, but Keeve Nachman, an assistant professor at the Johns Hopkins University Bloomberg School of Public Health, questioned whether that actually would be the case. “If you don’t do it right and you generate data that don’t truly reflect the situation of people living in communities near poultry operations, it might not be that helpful,” said Nachman, who also testified in favor of the legislation last year. Del. Robbyn Lewis, a Baltimore Democrat who sponsored the 2018 legislation, declined to comment on the new monitoring proposal. A spokeswoman said Lewis isn’t proposing similar legislation in 2019. 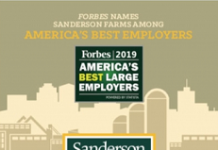 The poultry industry has been growing across the Eastern Shore in recent years, sometimes sparking conflicts with neighbors who were used to smaller, more bucolic poultry operations. Maryland poultry production surpassed $1 billion for the first time in 2017, largely because of changes in business practices that have made farms more productive and efficient, the industry said. ome concerned Eastern Shore residents have said they worry the farms aren’t just larger, noisier or smellier, but that the large amounts of poultry litter they produce also could foul the air and water. Delmarva Poultry and the Annapolis-based Keith Campbell Foundation for the Environment are together putting up $500,000 to pay for the new air monitoring equipment, which Maryland environmental regulators will operate and gather data from. Officials said they would use EPA guidelines to decide where to place the monitors, one upwind and one downwind of a farm or farms. And they also plan to use two existing monitors to establish a baseline for ammonia and particulate matter in the air more widely across the shore. “I’m convinced we’ll get useful information,” Grumbles said. Nachman said he isn’t sure of that, based on the information released Tuesday. 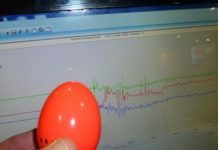 He questioned whether the experiment would be subject to peer review, or would be subject to public comment and input from a variety of scientific disciplines.